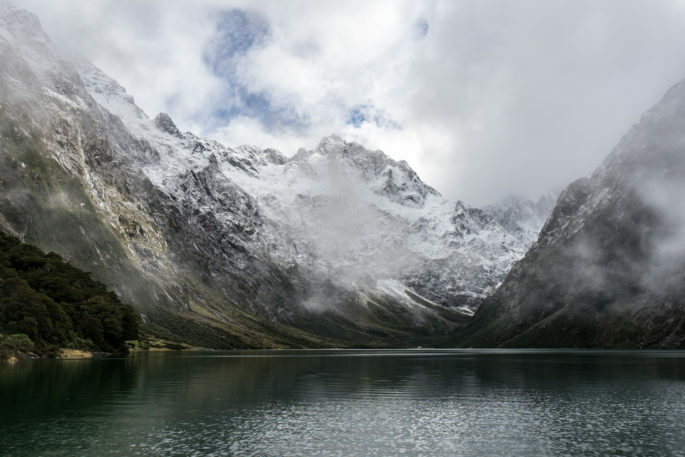 Fiordland National Park is well-known as one of the gems of New Zealand’s South Island. 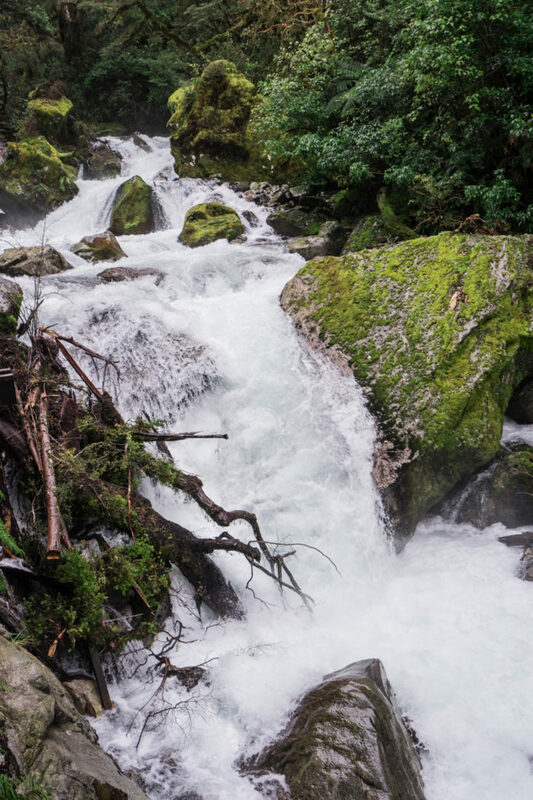 Teeming with day hikes and backcountry alike, beauty is tucked away in every turn of its untrammeled wilderness. 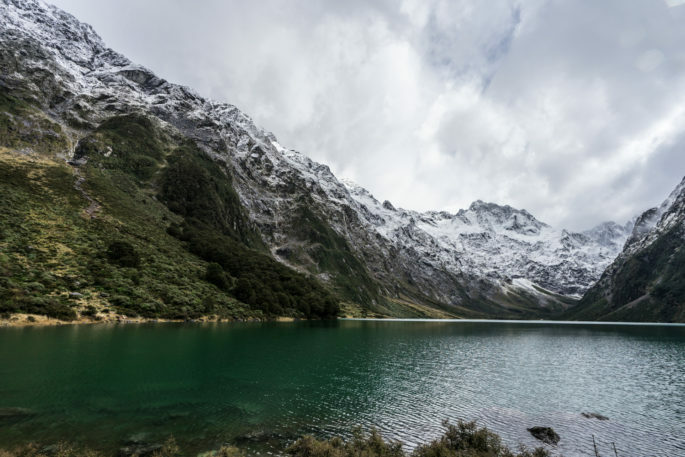 Lake Marian is located just off the Milford Road, a bit more than an hour of gorgeous driving north from the town of Te Anau. The official distance for this hike is 4.4 miles with just shy of 1,500 ft of climbing (though the mileage seems like an underestimate to me). 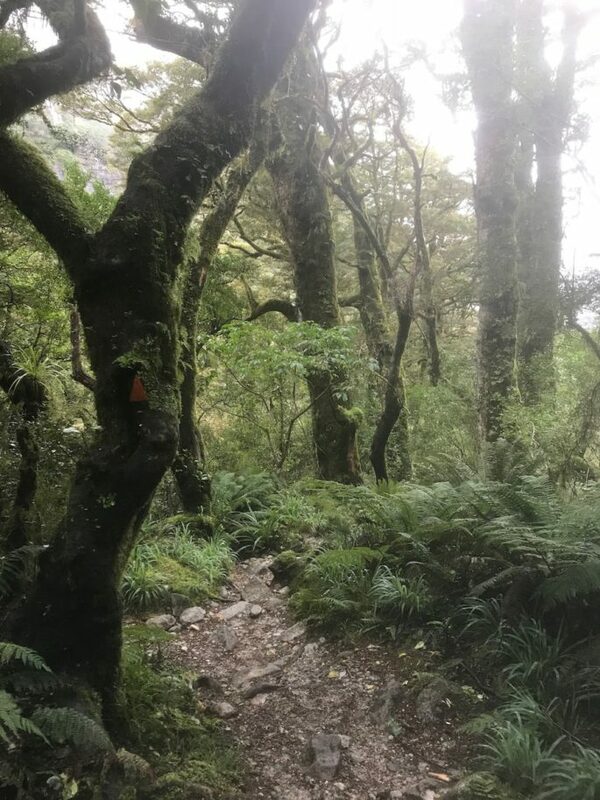 One of the funny things about New Zealand is that hikes are rarely listed in terms of anything other than the time it takes. I don’t know about you, but “3 hour round trip” doesn’t sound like a big deal, so I made the error of underestimating this hike. Although it’s not an extreme undertaking, it’s no leisurely stroll either. And that wasn’t the only surprise Lake Marian had in store for me. 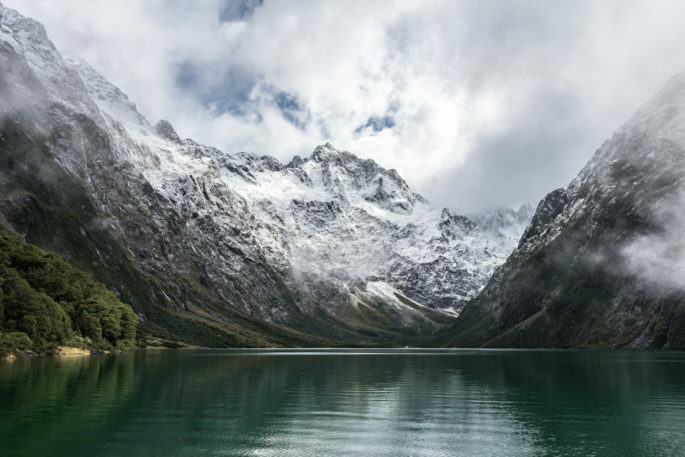 When I pictured hiking up to an alpine lake, I thought the journey would look like the destination of the lake itself: a rocky trek through mountain terrain. 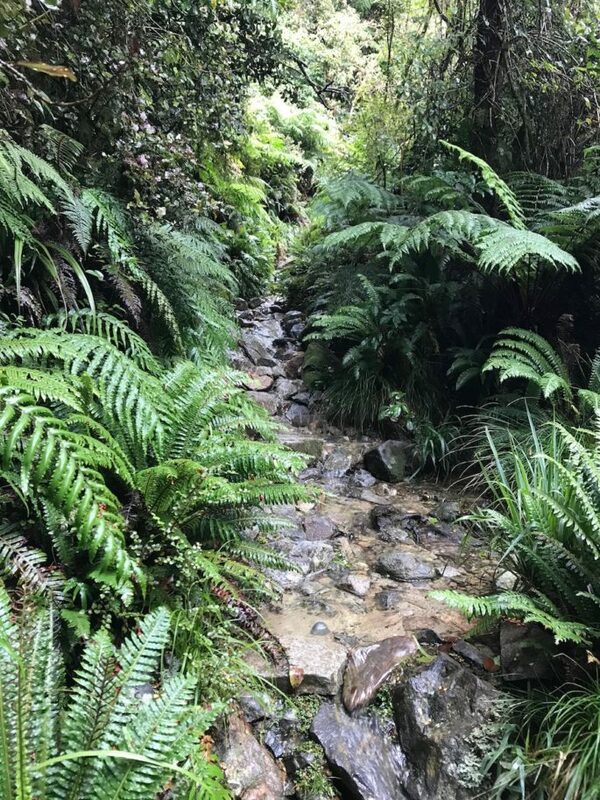 This hike was a straight-up muddy, mossy, soggy bushwalk. 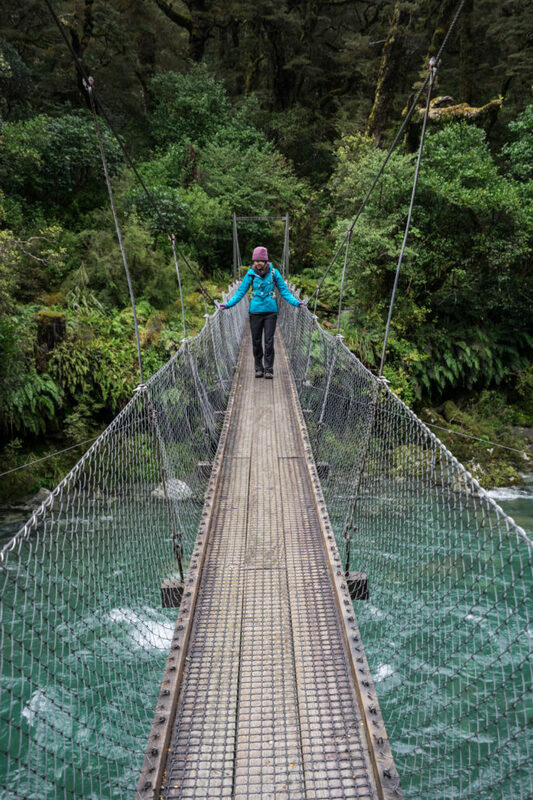 The hike kicks off with one of NZ’s signature moves: a narrow suspension bridge. I love these little bridges, gently swaying as beautiful hues of water rush beneath. On the other side of the bridge, it’s about a 10-minute walk on graded, well-maintained trail to The Gantry. 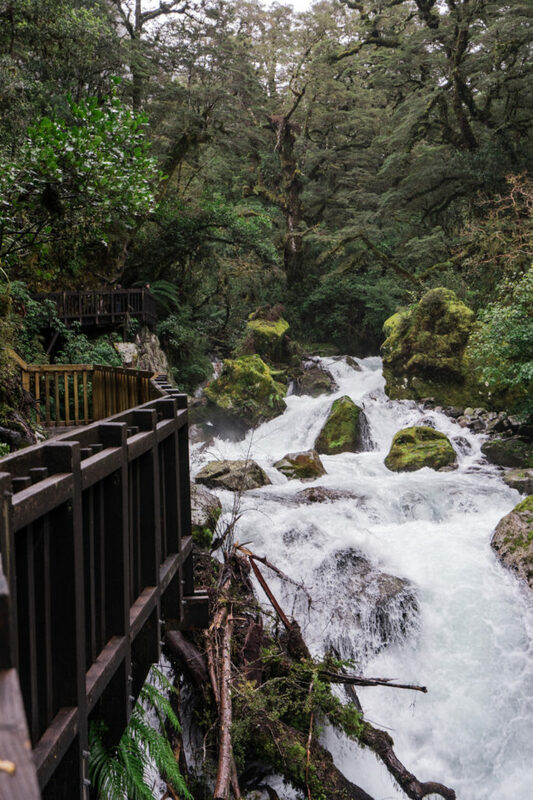 At The Gantry, the trail transitions to boardwalk with several viewing platforms along the Hollyford River. 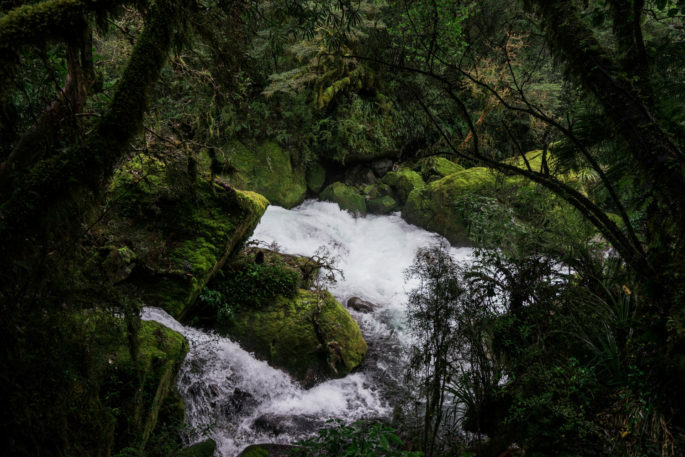 The rapids surge by, roaring hot white, crashing around moss-covered boulders the size of trucks. After living in Arizona for nearly 5 years now, the sight of this much water amazes me. The water gushed with raging force and the sheer volume of water passing by every moment made my head spin. Past the rapids and the viewing platforms, the trail changed completely. It narrowed considerably, though it was still easy to follow thanks to fluorescent orange markers. Steady rain fell nearly the entire way up, and conditions were so wet that the trail was basically a creek (yup, that’s the trail above), slowing down our ascent as we watched our footing. Though fortunately I was wearing waterproof shoes, I stepped gingerly around the water, trying not to tempt fate. 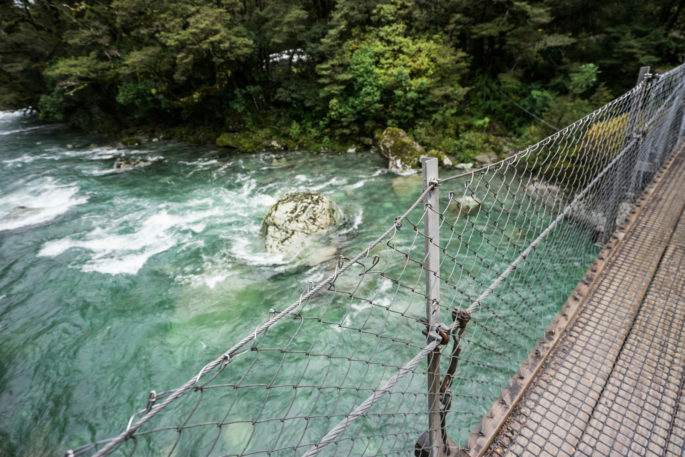 There were a few actual creek crossings where the water rose over ankle height, forcing us to rock-hop our way across. I didn’t want to risk damage to my camera from the rain or from slipping on the uneven, wet terrain, so I kept it stashed away in my backpack. I snuck these (underwhelming) phone photos instead. The climb up to the lake is nearly relentless. It only levels off for very short segments, and before you know it, you’re huffing and puffing again. There’s a small clearing about halfway up where you can catch a few views of the mountains surrounding you before diving back into heavy tree cover. A few short sections even required me to use my hands to negotiate rocks and tree roots. As we neared the top, large swaths of mud covered the trail. After almost 2 hours of climbing, we topped out and arrived at the hanging valley where the lake lay. Despite the foul weather, I had been trying to keep our hike in good spirits: our soggy toils would be worth it! The views would still be beautiful! The lake would still be dreamy! 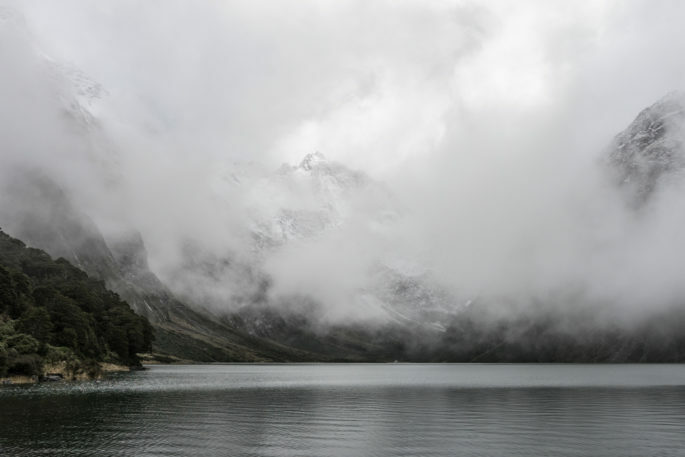 But when we stepped out of the bush and caught sight of the lake, I deflated. Clouds dipped low, obscuring the view except for the occasional fleeting glimpse. 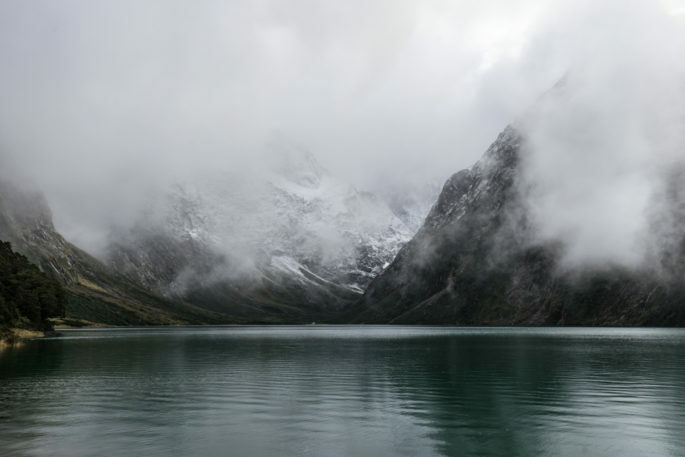 The lake still looked beautiful, reflecting the deepest teal green that only alpine lakes can conjure. 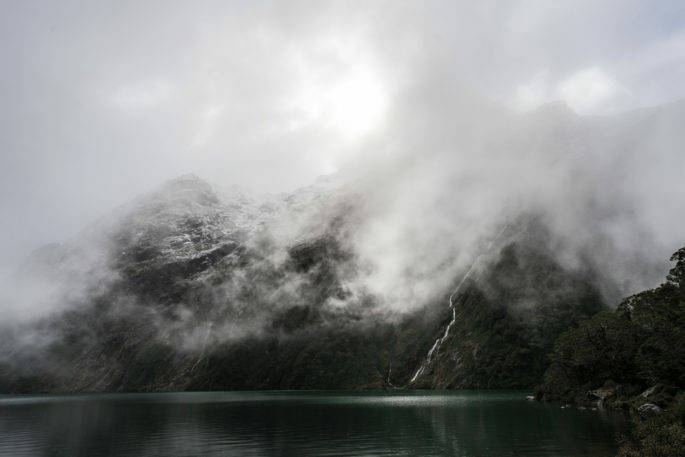 On the near side of the lake, waterfalls sliced down the mountainside. We were totally alone and all was quiet. I started to take some photos anyway, trying to make out the dim outline of the peaks on the far side of the shoreline. I was fussing with my camera when I caught sight of a bright spot of sunshine, burning hot over the mountains. A literal glimmer of hope. Sure enough, the sun made quick work of the fog, burning through its thick layers. For a few glorious minutes, Lake Marian revealed her splendor. 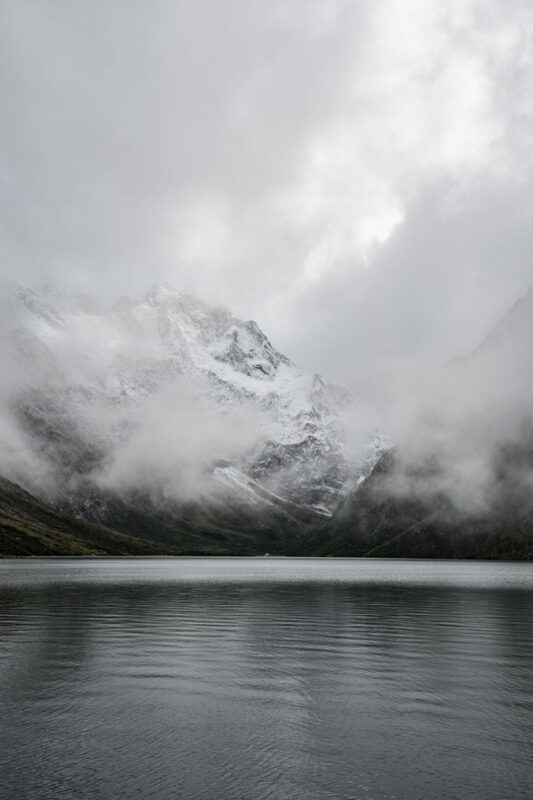 The snow line fell nearly to the level of the lake itself, decorating the peaks. Flecks of blue sky broke through the heavy cloud cover. The series of photos above were taken in the span of about ten minutes. We soaked in the magic, snapping pictures as fast as our fingers could manage as the scene shifted with each passing second. 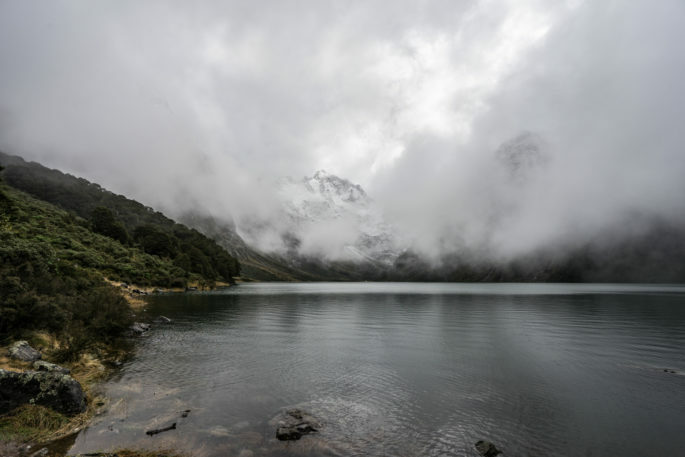 Just as fast as it had lifted, the mist descended back onto the lake and the mountains retreated from view. Everything turned grey, and icy snowflakes began prickling against my face. 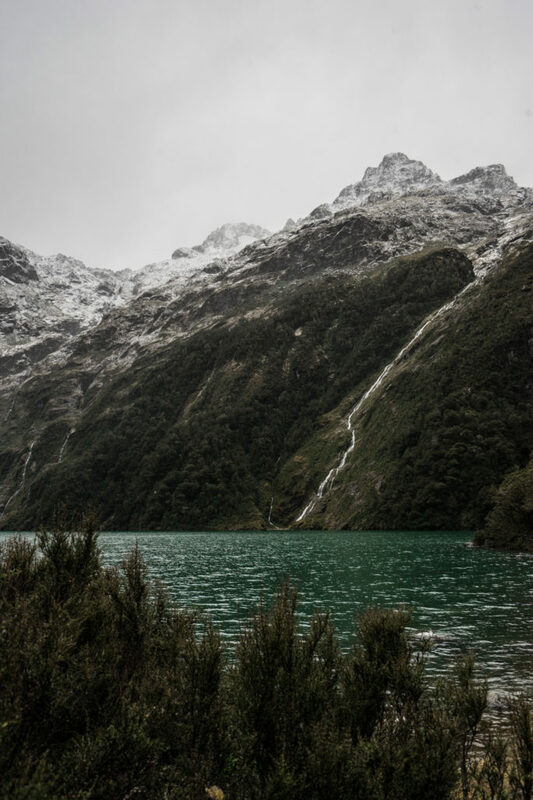 We tried to explore to the righthand side to try to get a different vantage point of the lake, but it was so overgrown and wet that our efforts didn’t bear much fruit. Other photos of Lake Marian show a rocky, beachy area, but when we were there, the water level was very high. The entirety of the rocky shoreline was submerged, limiting our options. We lingered for a few more minutes, waiting to see if the weather would shift for us once more. 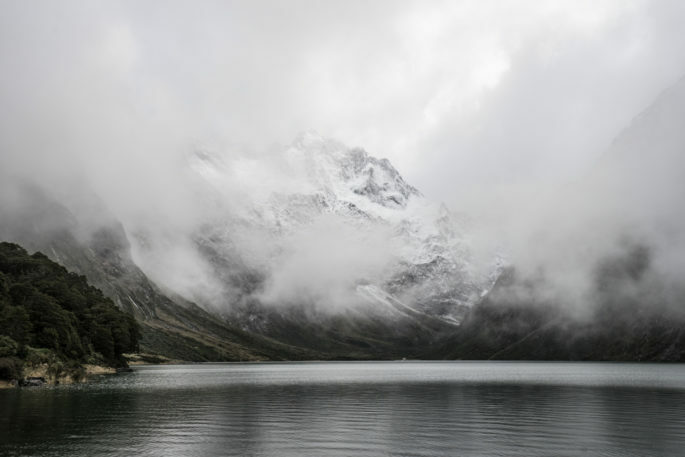 The fog seemed stubborn now, and I began to feel the damp cold seep more deeply into my skin. We packed away our cameras and scarfed down a granola bar. As we made our way out of the valley, I couldn’t help but look over my shoulder one last time. seriously. so gorgeous. 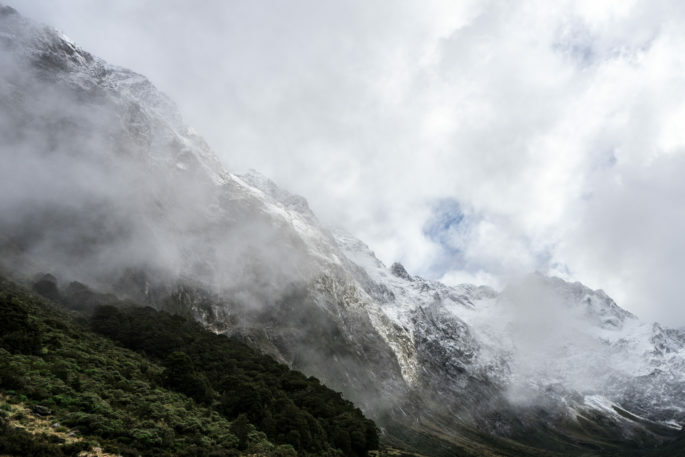 i love the grey misty magic of NZ. I’m so glad that the clouds parted for you for those precious minutes! Me too!! To all of it! 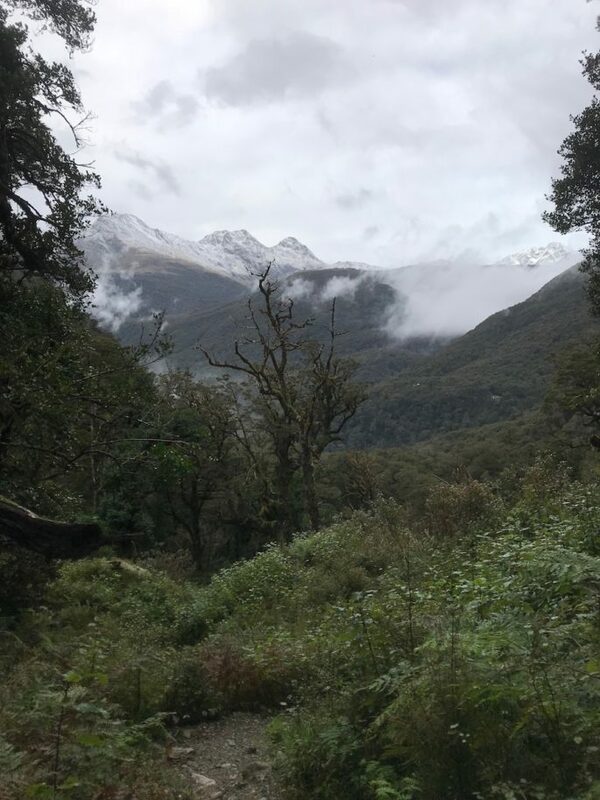 :) We got lucky–the Milford Highway closed due to snow the next day. We were just in time in so many ways. These are stunning photos! 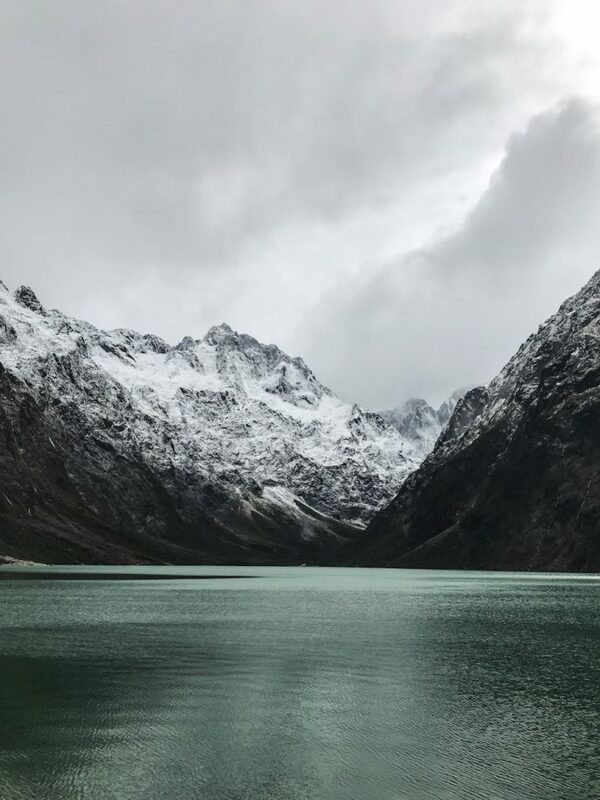 What kind of camera and lenses do you use for hugely expansive, scenic shots like this?